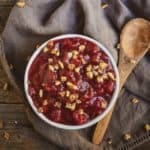 Super simple cranberry sauce recipe made with fresh cranberries, maple syrup, and orange juice! Delicious and fat-free. 2 1/2 to 3 cups fresh cranberries. Or use a 12-ounce bag of fresh cranberries. Juice from one orange (optional). Rinse cranberries. Pick out all the nasty, squishy ones. Blah. To a medium sauce pan add cranberries, water and maple syrup. Bring to boil over medium-high heat and cook for 5-7 minutes. Stir occasionally!!! Reduce heat to medium-low, add orange juice and let cook until the cranberries pop and mixture thickens. Usually, about 10-12 minutes. REMEMBER TO STIR OCCASIONALLY! Remove from heat and let cool to room temperature. Taste and adjust sweetness to your liking. But, don’t over sweeten. Cranberry sauce is supposed to be a little tart not a sugar blob. Store in a container and chill for a couple hours in the fridge before serving. For best result, let sit in the fridge overnight.